By tuning the thickness of this intermediate water layer, the researchers could carefully control the amount of heat transferred between graphene and biological tissue. They also identified the critical power to apply to the graphene layer, without frying the cell membrane. The results are published in the journal Nature Communications. Co-author Zhao Qin, a research scientist in MIT's Department of Civil and Environmental Engineering (CEE), says the team's simulations may help guide the development of graphene implants and their optimal power requirements. "We've provided a lot of insight, like what's the critical power we can accept that will not fry the cell," Qin says. "But sometimes we might want to intentionally increase the temperature, because for some biomedical applications, we want to kill cells like cancer cells. This work can also be used as guidance [for those efforts.]" Qin's co-authors include Markus Buehler, head of CEE and the McAfee Professor of Engineering, along with Yanlei Wang and Zhiping Xu of Tsinghua University. Typically, heat travels between two materials via vibrations in each material's atoms. These atoms are always vibrating, at frequencies that depend on the properties of their materials. As a surface heats up, its atoms vibrate even more, causing collisions with other atoms and transferring heat in the process. "In the body, water is everywhere, and the outer surface of membranes will always like to interact with water, so you cannot totally remove it," Qin says. "So we came up with a sandwich model for graphene, water, and membrane, that is a crystal clear system for seeing the thermal conductance between these two materials." 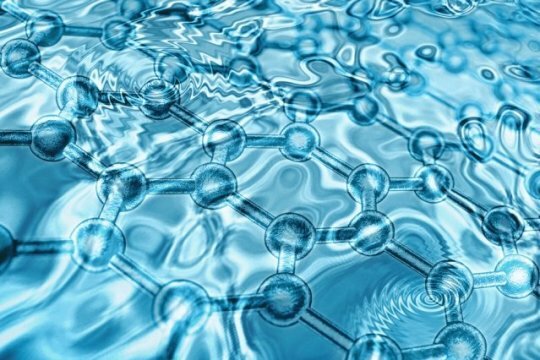 Qin's colleagues at Tsinghua University had previously developed a model to precisely simulate the interactions between atoms in graphene and water, using density functional theory — a computational modeling technique that considers the structure of an atom's electrons in determining how that atom will interact with other atoms. However, to apply this modeling technique to the group's sandwich model, which comprised about half a million atoms, would have required an incredible amount of computational power. Instead, Qin and his colleagues used classical molecular dynamics — a mathematical technique based on a "force field" potential function, or a simplified version of the interactions between atoms — that enabled them to efficiently calculate interactions within larger atomic systems. The researchers then built an atom-level sandwich model of graphene, water, and a cell membrane, based on the group's simplified force field. They carried out molecular dynamics simulations in which they changed the amount of power applied to the graphene, as well as the thickness of the intermediate water layer, and observed the amount of heat that carried over from the graphene to the cell membrane. Looking more closely at the interactions within this interface, the researchers made a surprising discovery: Within the sandwich model, the water, pressed against graphene's chicken-wire pattern, morphed into a similar crystal-like structure. "Graphene's lattice acts like a template to guide the water to form network structures," Qin explains. "The water acts more like a solid material and makes the stiffness transition from graphene and membrane less abrupt. We think this helps heat to conduct from graphene to the membrane side." Qin says going forward, implant designers can use the group's model and simulations to determine the critical power requirements for graphene devices of different dimensions. As for how they might practically control the thickness of the intermediate water layer, he says graphene's surface may be modified to attract a particular number of water molecules. "I think graphene provides a very promising candidate for implantable devices," Qin says. "Our calculations can provide knowledge for designing these devices in the future, for specific applications, like sensors, monitors, and other biomedical applications." Materials provided by Massachusetts Institute of Technology. Original written by Jennifer Chu.